Professor Barry Rubin passed on Feb. 3, 2014 after an 18 month battle with cancer. This from the Rubin Reports newsletter that I just received on a letter that Prime Minister Netanyahu sent on Feb. 9, 2014 to the wife and children of Professor Rubin. 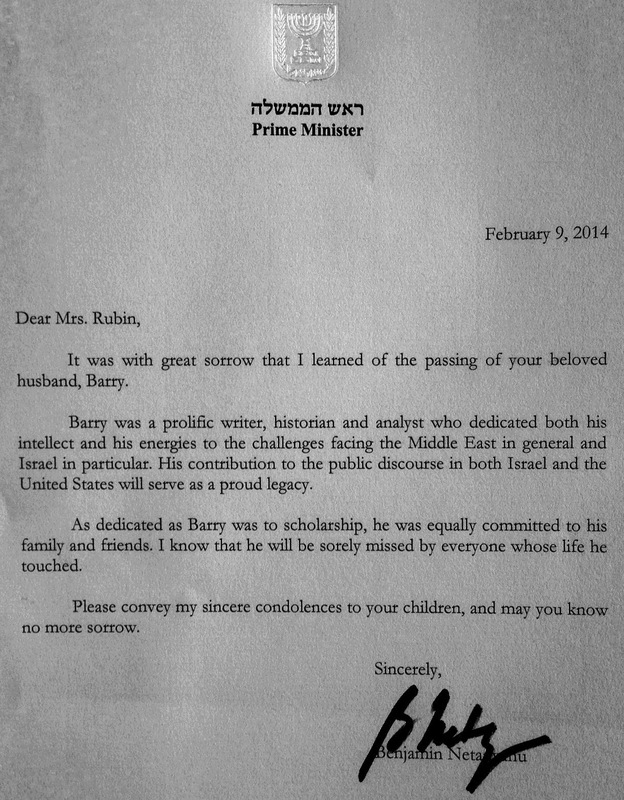 Israeli Prime Minister Benjamin Netanyahu wrote [in a letter addressed to Professor Barry Rubin's wife, Judy] on Prof. Rubin's passing, "Barry was a prolific writer, historian and analyst who dedicated both his intellect and his energies to the challenges facing the Middle East... His contribution to the public discourse in both Israel and the United States will serve as a proud legacy...."
What beautiful words of condolences by the Prime Minister of Israel. May Barry Rubin rest in peace and may God Bless Judy Rubin and the whole Rubin family.